*The P8AC STN has been upgraded and now all P8AC STN orders will be filled with the more energy efficient PG8AC STN* Features: Built-in 100 Micron Strainer Stops Particles Before They Enter the Waterway. ADA Compliant for Both Adult or Child When Properly Installed. Waterways are Lead-Free in Materials and Construction. Stainless Steel Top. Flexible Bubbler Guard. Heavy Duty Galvanized Steel Frame. High Efficiency Cooling Tank and Coil. Refrigerant R-134a. ANSI/NSF 61, Section 9 Certified. External Stream Height Adjustment. Split Level is Available in Standard or Reversed. Four Push Pad Activation. Suggested Specification: Model P8AC STN shall deliver 8.0 gph of 50° F degree water at 90° F ambient and 80° F inlet water. Model P8AC STN shall include front and side push pads to activate the flow of water. Basin shall be designed to eliminate splashing and standing water. 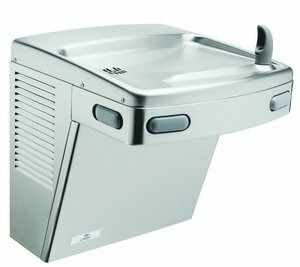 Bubbler shall have flexible guard and operate between 20 and 120 PSI. Cabinet finish shall be brushed stainless steel. Cooling system shall use R-134a refrigerant. Shall comply with ANSI A117.1 and ADA. Shall be listed by Underwriters' Laboratories to U.S. and Canadian standards. Shall comply with ANSI/NSF 61. Model: P8AC STN delivers 8.0 gallons of chilled drinking water per hour. This model satisfies CABO/ANSI A117.1 and this water cooler complies with ADA requirements when properly installed. Model also meet guidelines for children's accessibility providing the floor to orifice height is 30 inches and proper clear floor space is provided for frontal approach.